Check out our review of the LG G Flex smartphone. When invitations plastered in pictures of the LG G Flex began to appear for a December 4 event in Hong Kong, we had high hopes it would signal the rapid international rollout of this exciting new device, particularly as it coincided with leaks regarding a French release around the same time. Sadly, that’s not quite the case for anyone in America or Europe, but there’s still some good news. The LG G Flex has been announced for both Hong Kong and Singapore, where it’ll hit the shops on December 8 and December 13 respectively. However, the press release also says other Asian markets will announced before the end of the year, which will soon be followed by other regions. With Asia covered, we should be up next. Now, if LG is aiming to cover the East in the run up to 2014, it could be planning to show off the G Flex at either CES 2014 or MWC 2014 a few months later. Either would be a good launch platform for the phone, as it’s almost certainly going to be unique, given Samsung’s decision to keep the Galaxy Round in Korea. Trade shows such as these are ideal for demonstrating new technology, and the flexible screen and self-healing properties of the G Flex will see it stand out, even if it has already gone on sale elsewhere. 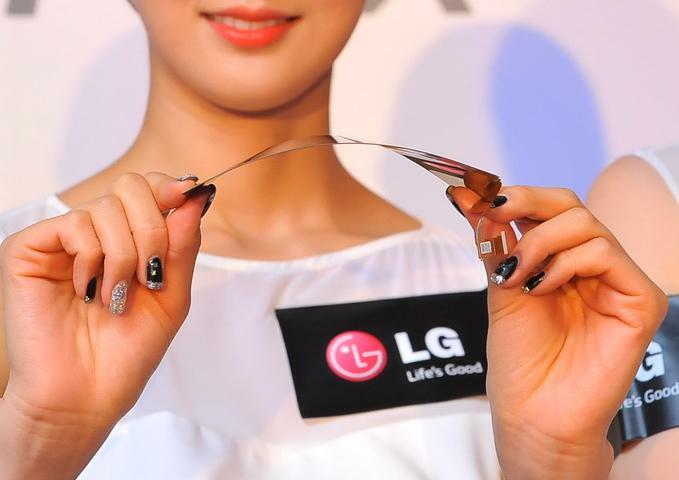 LG’s putting plenty of effort into creating curved and bendable phones, which involves not only producing the screens, but also special batteries (seen here to the left) to power the hardware, and expects the tech to become a major part of the smartphone market over the coming years. LG’s Head of Mobile Planning, Dr. Ramchan Woo, told SlashGear in an interview that by 2015, 12 percent of phones will be flexible and by 2018, that figure will have risen to 40 percent. Explaining why LG is investing so much in flexible phones, he quipped, “We got bored of flat,” adding the G Flex is only the beginning, and that it has many surprises still to come. Finally, he confirmed the plan was to get the G Flex on sale in America sooner rather than later.